Vote Yes CMK | What’s it all about? What does a ‘yes’ vote and a ‘no’ vote mean? A ‘yes’ vote gives local people more power over the way CMK develops and grows. That means protecting green open space and the grid road system, for example, building new housing to a high standard, and providing vital amenities for a fast-growing population. ‘Yes’ means that MK Council will have to adopt the people’s plan which will then guide new development, public transport and parking in CMK. A ‘no’ vote means that the old plan for CMK stays in place. This was produced by MK Council over ten years ago and has proved very unpopular. Key parts of it actually encourage developers to break up the grid roads and build on open, green space. Why am I voting on a CMK plan if I don’t live in CMK? 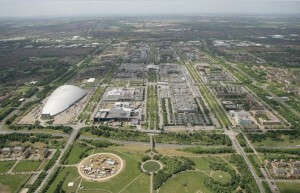 Wherever you live in Milton Keynes, the future of CMK is vitally important. It’s not just about shopping; it’s about jobs, housing, transport and parking. It’s about putting more heart and soul into a unique place we’re proud to call home. A fresh vision for Central Milton Keynes! 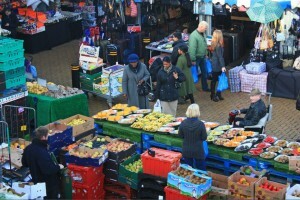 More independent shops and eateries to support small businesses and bring more life into CMK by day and night. More public spaces and places for the whole community to use – a medical centre, for example, plus mixed use development with spaces for live music, events, rehearsals, sports and meetings. Our very own purpose built university! The plan reserves a pristine site for a major new campus for 5,000 students to bring fresh life into CMK. Another prime site is set aside for a prestigious new company HQ and the thousands of new jobs it will bring. Thousands of new homes are already earmarked by government targets for the two grid squares, including affordable and social housing. The plan sets a high standard of design and eco-friendliness for all. More mixed use development, including more apartment living for young and old, to support local shops and populate the centre by day and night. A stunning new Market Hall for specialist, independent outlets, in addition to the existing, lively outdoor market in Market Square. Upgrading Market Square (eg with public loos and better lighting) to make this vibrant area more appealing. A new public space or square for relaxation, fun, creative and civic events. Ease of access and parking have always played a vital role in CMK’s success. The plan provides more parking for business developments in CMK, and more visitor parking for residents in Campbell Park. Parking facilities will be required to incorporate real-time monitoring and digital-sign technology to make it easier to find unoccupied parking spaces. The plan proposes a high frequency CMK shuttle service to link up all business, retail and parking areas, thereby making better use of under-used parking spaces. In the long term, public transport, walking and cycling have to take a larger share of journeys. The plan identifies sites for a second public transport hub in the main shopping area, with integrated passenger facilities, including seating, café and toilets. To promote more cycling, new developments are encouraged to provide secure cycle storage and changing facilities, as well as contributing financially to improvements to the cycle network. Finally, the plan aims to make walking in the centre more enjoyable and safer. Developments facing the boulevards and gates should provide active entrances and glazed façades on the ground floors, and offer weather protection such as colonnades. CMK has a strong identity or ‘brand image’. 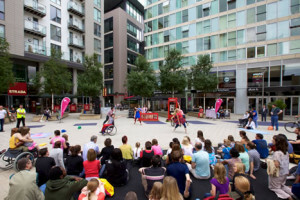 The Plan respects CMK’s unique public realm, which improves the quality of life for residents, workers and visitors alike, and makes CMK so different from anywhere else in Britain. New developments will need to respect the classic CMK infrastructure – our unique New Town heritage. This includes the grid roads, broad tree-lined boulevards, pedestrian underpasses and porte cocheres (covered walkways). Other policies protect Campbell Park and other public open spaces as well as creating new ones, including a new boating marina on the canal. New buildings taller than eight stories will have to pass strict criteria before being approved, including ‘wind tunnel’ effects and overshadowing. The design details and materials of new buildings must be of high quality. New development will need to stay within the development plots, and not spill over onto the grid roads, pedestrian routes etc which continue to work so well. 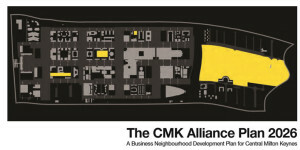 This means that CMK can continue to grow but without losing its spacious, convenient, safe, leafy and timeless character. This is very much a ‘people’s plan’. It has NOT been prepared by officials at Milton Keynes Council – instead it’s been crafted by local people who care passionately about the future of CMK. MK residents, community groups and business people have been involved at every stage of the plan to produce this blue-print for sustainable growth. To maintain balance, the steering group has included members of the CMK Town (parish) Council, local Ward Councillors, the Chamber of Commerce and Small Business Federation, voluntary sector and the Parks Trust. 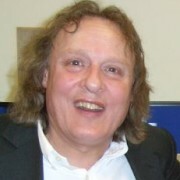 The plan passed its technical test with an independent examinerwith flying colours. If approved at both business and residents’ referendums on May 7th, it will take its place as a powerful set of planning policies against which future development proposals and planning applications for CMK will be judged. The plan is the result of almost 3 years of voluntary work by local people, who have engaged with as many residents and businesses as possible. A special website was set-up in April 2012 which attracted over 800 visitors and 150 registered users across Milton Keynes. Eight public workshops were held, five ‘expert panel’ sessions and 20 stakeholder meetings with a wide range of commercial and not-for-profit organisations. Until recently, only local authorities (such as Milton Keynes Council) had the right to prepare plans, which are used to guide new development and planning applications. Even though plans were subject to ‘public consultation’, the local authority had the final say, not the public. But that changed in 2011 when the Localism Act created ‘neighbourhood planning,’ which gives local people new powers to create their own plans for their ‘neighbourhood’. Neighbourhood plans make the planning system more democratic by letting local people, who know about and care about an area, undertake the planning for it. Once local people have prepared their ‘neighbourhood plan’, it must be examined by an independent expert to make sure it is ‘sound’. The plan is then put to a referendum vote so the entire community has the final say on whether the plan should be adopted or not by the local authority. The CMK Business neighbourhood plan passed its independent examination with flying colours in April 2013. It now goes to referendum on 7th May 2015. 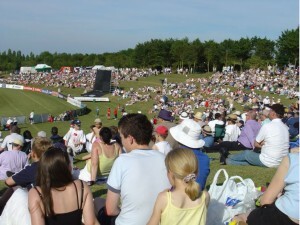 Woburn Sands was the first area in Milton Keynes to hold a referendum on their neighbourhood plan. It passed last year, with 89% voting YES! Many other areas in Milton Keynes are currently working on neighbourhood plans, including Olney, Stony Stratford, Newport Pagnell, West Bletchley, Wolverton, Bradwell Common, Bow Brickhill, Great Linford, Sherington, Walton, Wavendon, and Woughton. However the CMK plan is unique. It’s the first business neighbourhood plan in the country as it covers an area which is predominantly commercial. Significantly, two separate referendums will be held, one for residents and one for businesses. If one referendum passes, and the other fails, MK Council has no obligation to adopt the plan. The decision to cast the voting net so wide was only taken this year, so it’s a huge challenge to inform people outside the immediate area about this major new plan. Click on the image above to read or download a 4-page summary of the plan prepared by the CMK Town Council (reproduced by permission of CMKTC). Read the whole 120 pages! 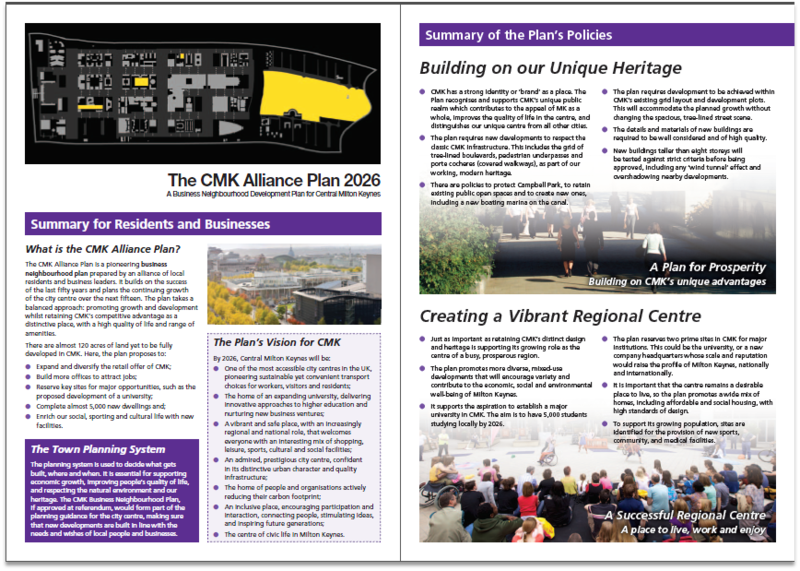 The CMK Business Neighbourhood Plan is a comprehensive 120-page document. Read the plan here. People across the country will be looking at what happens in Milton Keynes. A yes vote moves power into the hands of local people. It’s a pioneering plan and reflects the ‘can do’ attitude of Milton Keynes. Don’t be put off by the boring name of the plan – it will help shape the future of the city centre and if you live in Milton Keynes it will affect you. Local people know what’s best for their area, not the Council. That’s why I’m voting yes in the referendum. We have reached a very crucial stage as we near the referendum. It is important that the local community hears about and understands the plan.